The 5p bag charge which is active on single-use plastic bags across the UK could rise to 10p. The 5p plastic bag charge was first introduced in Wales on the 1st October 2011. In England, it was introduced in October 2015. The aim is to reduce the amount of single-use plastic bags being used and try to prompt people to buy the bag for life, or remember their bags every time they shop. It is all to reduce the levels of pollution. British Prime Minister, Theresa May, has hinted that the 5p bag charge may be doubled to 10p soon. A consultation surrounding this will be held later this year. It is estimated that around three billion single-use plastic carrier bags are being supplied by small and medium businesses every year. These types of bags can take up to 1000 years to break down and can seriously damage wildlife. The money raised from single-use plastic bags is now to be donated to charity. In 2017-2018 a total of £58.5m has been donated to charities from the 5p bag charge across the UK. 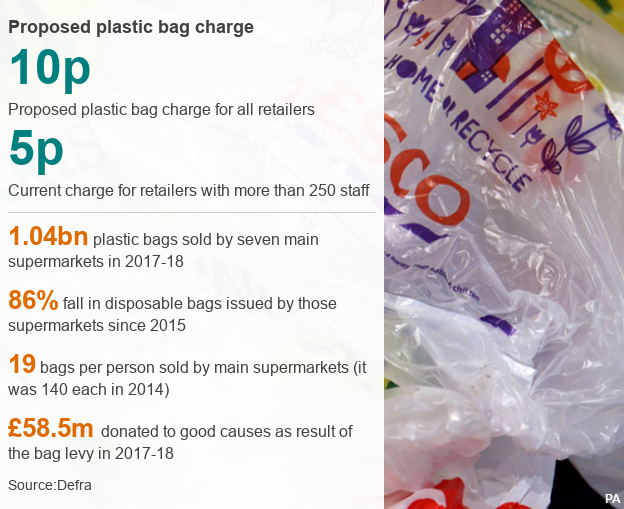 Approximately, 4.3p from each 5p bag sold went to charities, according to 2/3 of retailers who gave information on where the money from the bag charge went. Tesco have already stopped selling their 5p bags. Instead, now you can only buy their 10p 'bag for life' carrier bags. Sainsbury's have made their 5p bags thicker and stronger - this means that they no longer class as single-use carrier bags.